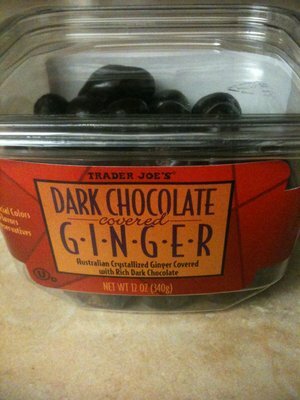 I picked up Trader Joe’s Dark Chocolate Covered Ginger because, well, it sounds kind of terrible. Why would I do that to myself? Perhaps I’m insane. Perhaps. 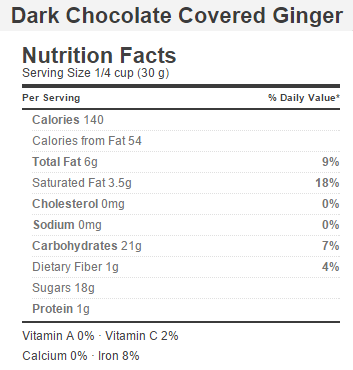 At any rate, I like both dark chocolate and ginger, but taken together they sound a little bit off putting. Both alkaloid rich dark chocolate and intensely strident ginger are strong, acquired tastes that are best used sparingly. So what was TJ thinking when they decided to give us huge globs of dark chocolate, stuffed full of spicy, candied ginger? I can’t begin to imagine, because really, these globs aren’t particularly good. While that isn’t the case here, there is still plenty of ginger in these hefty morsels, and that strong ginger taste simply does not mesh very well with the strident bitterness and subtle sweetness of the dark chocolate. There is a way to enjoy these, but it isn’t by snacking on them. Instead, these fall squarely into he camp of sophisticated thinking-man’s sweets. To enjoy the experience of eating one of these you really need to be thinking about it – thinking about the clash of spicy, sharp ginger with its own crystallized ginger exterior, while simultaneously appreciating that whole clash as it clashes with the bittersweet dark chocolate its enrobed in. That’s a whole lot of clashing and honestly, in my opinion, it’s not worth it. Yes it’s a novel taste – but not so novel as to make up for all the sugar and fat you’re eating. There are plenty more sophisticated chocolate tastes in the world, such as Trader Joe’s Stone Ground Salt and Pepper Chocolate, and if you’ve got a candied ginger hankering crystallized ginger is pretty good on its own. Combining these two does neither any favors and should probably be relegated tot he dust bin of novel failures, along with Trader Joe’s Dark Chocolate Nibs. Would I Recommend It: I’d recommend either of these things separately, but not like this. Would I Buy It Again: Nope. Done with these. Final Synopsis: Two great tastes that taste confusing and strange together. These are fabulous! Do not believe other opinions! I agree, they are addicting! But at least a somewhat healthy addiction!! Fabulous!